All: Chanting of OM three times. Valerie: Today is August 1st, it is Saturday and we are in Singapore at Swami Home. With great love and respect in our hearts we are calling upon Cosmic Sai Baba to make his presence here amongst us. ❝I am here! And I am very pleased to be here amongst you. I have come before, and I come again. So thank you, thank you, for inviting me. Valerie has been travelling (and is) a little over tired …. so we will make allowances for that. And I say this – meaning – I will not make my presence for too long; but rather, to just give you a message just as I have been giving through her, every month, for some time. There is a trouble here upon this Earth that needs to be rectified. It is a time that energy of people that hold the energy in their hearts of Mohammed. Mohammed is a loving prophet who has given a beautiful religion – one that is shared by many and equally there is also a religion known as Christianity that has been given through One who has been known for nearly two thousand years. The messages that came in the first place were both of love and sharing and caring for … and loving each other. While teachings have been given so that people have a way to live, a way to (er, how can I say) to hold values in their lives and to teach children how to behave. For the people that come with a soul, have not all come from the same place. I would like you to remember that. There are many, many cultures and customs and races in other worlds. There are worlds, upon worlds, upon worlds – that operate in different frequencies, different vibrations and certainly different forms. And in some ways those FORMS are being introduced to children in the form of comics, television and in a way to help them to accept a form that is alive with a consciousness that is not the same as an Earth person. However, it has filled with ideas and thoughts put into people’s minds to help them to create this evolution within the Man’s world – earth-man’s world – to help them to begin to understand other worlds. And to know that there is something to it. The new generation coming with your children will readily accept new forms and new ways of doing things … in fact many have come to help ring changes for there is much – you will agree – upon this Earth that needs changing. There is much that needs to be let go. There is much that needs to be held onto in the loving, the caring and the respect for each other, for all. This is what I want you to remember with the two religions that I mention. And I bring this speech – at this time – there is friction between the two religions. Not with everyone of course – it (friction) is not the association – the creed – of each religion. It is not the institution that is persecuting – for their strength – as I have said – is one of love, of caring, and always respecting one another. However man has gone on to change the teachings and to include other ways of behaviour. This is NOT in their teachings of their religion. And so there needs to be respect for their teachings and encouragement in every way possible for the two to come together and agree not to disagree but to respect their differences. And I do hope that what I am saying is not going to be taken out of context at all. Because it is not meant to be upsetting or judgemental – far from it – it is meant really to encourage all to realise that they come in a soul from many different places – many different ways of thinking and experiencing – that are new to them here upon this Earth. This Earth is a level playing field – one of family – and that does not always exist in other worlds. So it is an opportunity for some souls to come to experience love and family and that bond that is taking place is very important – very important – for them … … … to experience that bond that is never broken in a family. It is always, always bonding in a way that holds people together … with an unseen line of family and filial links that holds that love of God in them. This is what being spiritual is about, really. Everyone has come from the Creative Source of All. And I would like everybody upon this Earth to remember that. The main point is LOVE. Sai Baba – in an earth form – constantly said GOD IS LOVE. And that is all there is. And if you think about LOVE it is Universal. And I am talking about LOVE in its over-ruling and over-encompassing way. It is not something to be mis-used. Or to force a fight over. It comes from the Source of Creation – the same as all of you on Earth are. And I would like you to remember that. It is that simple. You all come from the Source of God of Love. So please think about it as this – of Light of Love and Caring and Sharing and Serving and live a life that you can be happy about and proud of. There is no judgement once you leave this earth body and move back to the World of Light. It is a place where you actually review your own life and from the energy that you operate in once you come to the World of Light – it does not exist with thoughts of raising a weapon to sort out a problem. So please know, know that you are working against yourself by even considering using weapons to sort out problems. Prayer and using meditation is the best way of connecting to God of who you are and the God that exists everywhere. It can be stronger in some more than others. It can be over-powering if someone is doing or is responsible for something in the name of God. But it is never meant to hurt anyone … … or anything. So please remember that. I implore you to do everything you can to learn of the differences in understanding – rather than judgement – between the two religions that are having problems in understanding each other. Everything comes from the same place. THERE IS ONE GOD WHICH IS LOVE. Thank you my children, thank you. God bless you. God Bless you. The final transmission from Cosmic Sai Baba was given on 6th of February 2018 at Moss Vale, NSW, Australia. During August 2013, prior to the normal transmission, Cosmic Sai Baba also gave a meditation, which you can read and listen to on this page. 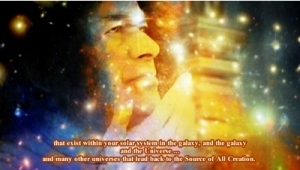 A summary of transmissions by Cosmic Sai Baba about the 4th dimension and changes has been made available. You may read Understanding the 4th Dimension. In order that you might understand how these transmissions from Cosmic Sai Baba are received, there is a video of one transmission here. A special photo was given by Cosmic Sai Baba on 9.9.09 … you can read the story and view these pictures here. A page has images of Cosmic Sai Baba walking out of the picture frame. You can read and see the images here.